As editors, we cover a decent amount of engagement ring trends, and the overarching theme we've picked up on recently is nontraditional choices. This can range from anything like choosing a different stone cut to forgoing a diamond altogether, which is why we think it's about time an underrated stone got its day in the spotlight: the moonstone. A bohemian favorite adored by a lot of jewelry designers (especially in L.A.), the beautiful iridescent stone is gaining popularity in bridal jewelry across the board, and after one look at the following rings, it's hard not to see why brides-to-be are opting for the romantic stone. While the vibe of a moonstone is certainly different from that of a classic diamond solitaire, for instance, the jewel is no less special, perhaps even more so. If you're like us, it might remind you of the mood rings we were so charmed by in our childhoods—only in a much chicer, more grown-up embodiment. The way the light catches a moonstone's many changing colors is just one reason to fall in love with it. It's often said that moonstones elicit new beginnings, in any capacity of one's life, and that they heighten our intuition and positive energy, making them an especially potent trigger of our empathetic and compassionate sides. When chosen in an engagement ring, it will bring new energy in and around this new chapter in your life. 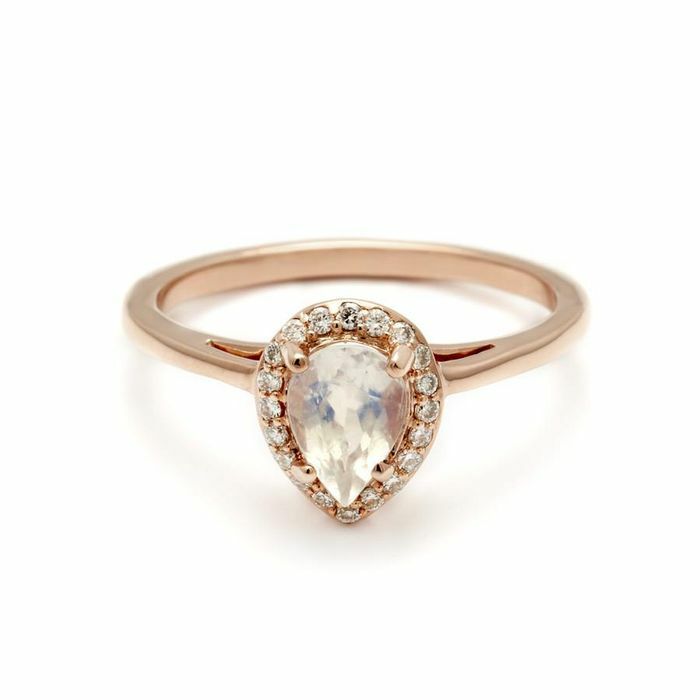 Keep scrolling to see 20 stunning moonstone engagement rings you're guaranteed to love. The pear-shaped detail remains a popular cut for its romantic and vintage-inspired feel. This moonstone's bluish tint is complemented so well by the gold setting and band. A hexagonal moonstone ring adds an extra dimension to this stunning ring. Framed in diamonds, this one commands attention. This arc-shaped band is truly unique. A neutral-tone moonstone set in gold means you'll be able to easily wear this ring with your other gold jewelry pieces. A unique ring that you can still wear every day—how perfect is that? Luna Skye's pink- and purple-inflected moonstone ring is the perfect dreamy pick for a boho bride. Its elegant setting is simplistic enough to let the unique stone shine. Natural-shaped rings add a more authentic flair. This organic-shaped stone is instantly eye-catching, with its dainty diamond-encrusted setting and ring catching the light at every turn. We love the more traditional emerald cut on this ring, which we see often for diamond rings. But take a closer look and you'll realize just how multidimensional the colors are in this stunning rainbow moonstone. The center stone is also framed by triangle-cut diamonds, which the designer notes "lead the eye from the perfectly proportioned center to the subtle knife edge band." This three-stone ring is absolutely beautiful. Between the rainbow hue of the moonstone, the small accent diamonds, and the gorgeous gold band, there's no reason not to love this classically elegant ring. This is a standout. In another one-of-a-kind design, this ring's organic-shaped mini moonstone is beautifully framed by eye-catching diamonds. Truly "a moonstone you can get lost in." With one look at its tinted blue circle-cut stone, we feel like we're looking down the bottom of the ocean. Dreamy, right? You're guaranteed to receive many a compliment and question about this unique ring, the perfect mix of bright and artful. Your finger will pop with this ring on it. Unlike any of the other rings in this roundup, this geometric shape feels so vintage and cool. Plus, the gold band accents the colors in the stone perfectly. Not just your classic diamond band. The moonstone in the center adds an elegant dimension to this elevated ring. This royal blue stone paired with the accompanying diamond detail gives this ring both a soft and uncommon touch. Looking to stand out? The beautiful color of this stone makes the ring both interesting and versatile. Talk about unique. You're guaranteed to be the only person with this chic, standout moonstone ring. This ring is classic and stunning. You absolutely cannot go wrong with the bohemian moonstone take on this engagement ring style. Yes, moonstones can come in more than just an oval shape. This rectangular cut is guaranteed to stand out. If you absolutely love yellow gold, this ring is for you. The thin band paired with the large stone and gold halo is any gold lover's dream. This vintage-inspired piece gives off a modern '70s vibe. There's a reason this cut has remained in style for decades—it's a perfect forever ring.